Thursday, February 8, 2018 ~ 2:00 p.m.
Wednesday, February 7, 2018 ~ 5:00 – 7:00 p.m.
Gladys Faye Laune, 91, of Ashland, NE, died Saturday, February 3, 2018 at her home in Ashland, NE. She was born March 11, 1926 in North Platte, NE to Grover and Laura (Jewell) Eggers. Gladys graduated from North Platte High School. On April 14, 1977, she was married to Allyn “Pete” Laune at Lincoln General Hospital in Lincoln, NE. Through the years, Gladys worked for the hospital in North Platte, Lincoln General Hospital, Tabitha and Madonna Rehab before working in insurance sales. For ten years, she owned and operated Ashland’s first health club while operating her daycare. Gladys also worked as a CNA at the Ashland Care Center until she retired. Gladys enjoyed cooking and playing Bridge with her two Bridge Clubs. She was active in her church and she always enjoyed her family, especially her children, grandchildren and great-grandchildren. 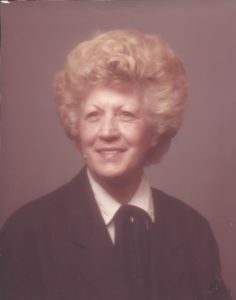 She is survived by husband, Allyn “Pete” Laune; children, Janet (Doyle) McIntosh of North Platte, NE, Debra (Royce) White of Spanaway, WA, John (Judy) Anderson of Baton Rouge, LA and Gerry (Christine) Anderson of Ashland, NE; 19 grandchildren and 44 great-grandchildren; sister, Ruth (Robert) Radke of Lewellen, NE. She was preceded in death by daughter, Linda Jo Mueller; parents, Grover and Laura Eggers; siblings, Lola, Harry, Roger, Edna, Ruby, Betty and Russell. Gladys was a very good friend to all and another one of those good nurses aides who paved her way to heaven. She will be missed immensely by her bridge buddies including myself. Pete, Our Thoughts and Prayers are with you and your family at this time.